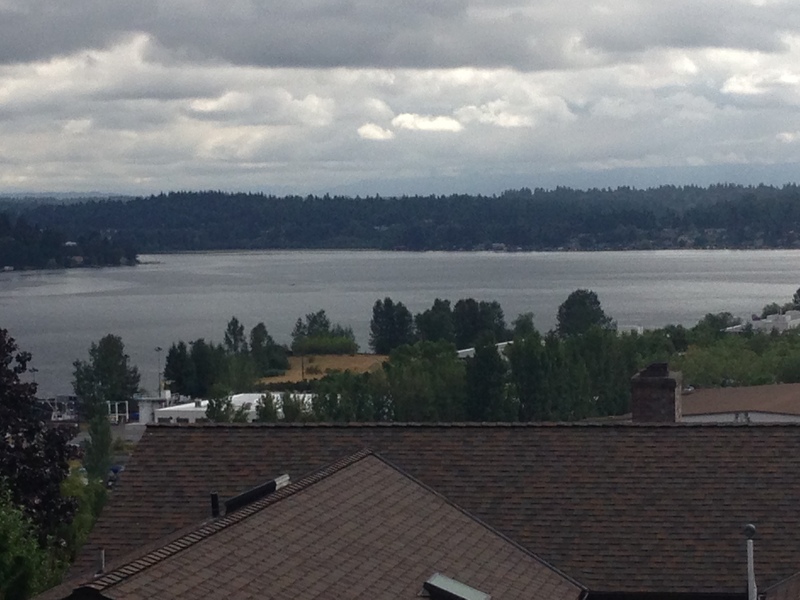 After my practice this morning, I stayed a while and looked out over Lake Washington. I’m visiting friends in Seattle, and they have this balcony with a view that stretches for miles. On a clear day, I can see all the way to the Cascade Mountains. Today it’s overcast, but the sun is shining brightly behind the clouds. When I first opened my eyes and looked out, I saw a break in the clouds where rays of light came through illuminating the hillside on the far side of the lake. It was so freakin’ pretty. I saw the water reflecting the sun. I saw the tiny rooflines tucked into all the trees. I saw an outcropping of a rocky beach and then I saw these streams on the surface of the lake where the light had a different quality. It was as if I were seeing all of it for the first time. It’s funny to me how something can be right in front of my eyes and I can’t see it. This is probably happening most of the time. I have this habit of doing one thing but half-planning what’s coming next. And when my mind is only half here or has already moved on, I’ve noticed that it’s hard to see stuff. I’m not just talking about contemplative, subtle, or far away details, either. How many times have I scrambled through a kitchen drawer looking for a gadget and not been able to see it sitting there? After practice, I was in a different mode. My mind and my body were calm. I didn’t have anywhere I would rather be. I wasn’t thinking about breakfast or my agenda for the morning or how much that house across the street costs. I was quietly looking at the vista and seeing what was there.